Specializing in “Authentic New York Style” pizza. 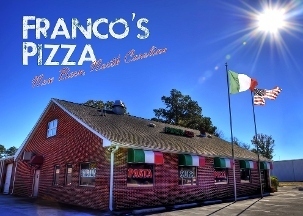 They make New York style and Sicilian pizza along with strombolis and calzones. A variety of hot and cold subs are also available. Italian dishes such as baked ziti, veal parmigiana, baked manicotti are just a few of the many dishes that they offer. We had a slice of NY style pizza and shared a stromboli (pepperoni, sausage, mushroom, cheese and sauce).